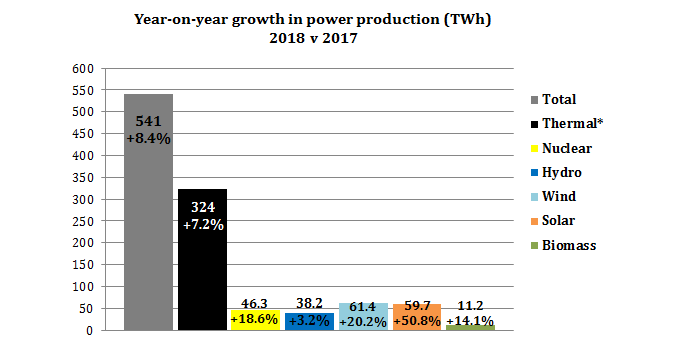 Thermal generation has increased by 7.2% year on year, totally dwarfing the increase from all other sources combined. New thermal generating capacity, amounting to 4% of existing capacity, has been added during the year. Demand for power continues to inexorably rise in China, and, as we have seen in the past, renewable energy is not capable of meeting more than a tiny part of this extra demand. 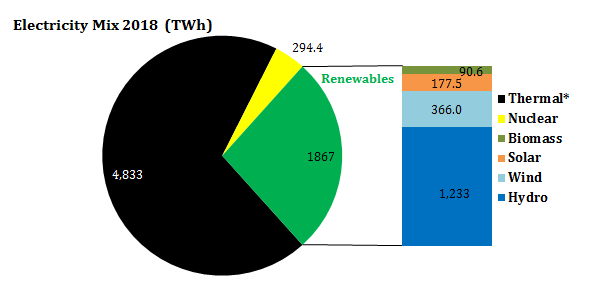 Last year, for instance, wind and solar only supplied 22% of the extra demand. We keep hearing that China’s economic growth is slowing down, yet emissions of CO2 will surely show another big rise, when we get the data for 2018. But, but, but. China’s wind increased by a mighty 20% & solar by an incredible 50%, so dwarfs the mere 7% thermal! See, you just have to look at it the correct way! Yes, percentages are often quoted when the numbers are small. Witness the drivel about UK car sales that is in CityAM today claiming big increases for hybrids and EVs, without mentioning that the vast majority are hybrid. As the saying goes a 100% increase in naff all is still naff all. Let’s face it even Biomass is actually thermal as well. ps Paul, Roger Andrews on Energy Matters passed away last night aged 77. Not forgetting, that the Greenies also love to boast about China’s renewables’ *capacity* increase. And the Synod of the Church of England thinks that we will achieve what they call a carbon neutral position this century, helped by their virtue signalling disinvestment in fossil fuels. Sad delusion based on poor scientific understanding. … and poor economic understanding. BBC trumpets the success the UK is having fighting Climate Change. But doesn’t mention either how many degrees of warming nor how long climate disaster has been delayed by the UK reducing its Carbon pollution. They do however complain that money is being spent on the wrong things to make even greater progress. Nor do they say how many TWh of thermal generation they saved, nor how much electricity costs in the UK vs how much it costs in China. One does not have to believe in conspiracy theories to see the direct correlation between China’s GDP growth in the last decades and the West’s industrial decline. The MSM effectively disregards China’s (and others) fossil fuel usage and continually rails against the West for not reducing theirs enough. If fossil fuels really are as deadly as being portrayed shouldn’t everyone stop using them? Obviously a rhetorical question but why aren’t more people asking? So Thermal output increased by 324 Twh which is not far short of the total wind output of 366 Twh and nearly double solar at 177 Twh. Or, to put it another way, the total wind output would have to double just to keep up with the growth in demand, without looking at displacing any thermal. Increasing the disparity between our electricity costs and China. Another nail in the coffin of our manufacturing sector. Increasing imports and simply transferring our CO2 emission to overseas.